Looking for a hearty salad that is perfect for dinner? This chopped chicken salad will offer a refreshing light dinner, but no one is going to walk away hungry! Have you ever come home and wondered if you serve chicken salad in a unique way? This recipe for chopped chicken salad gets its name from all of the goodies that are chopped up and put into this salad. 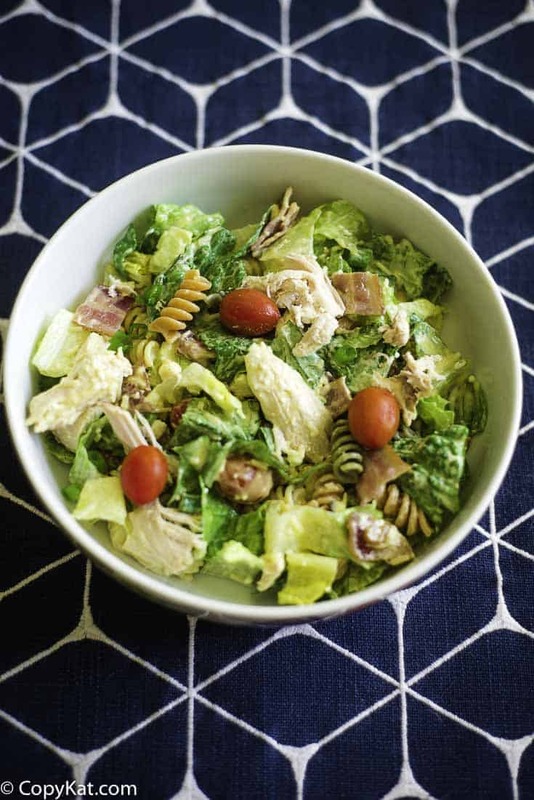 This salad is packed full of cooked chicken, bacon, tomatoes, onions, and so much more. It’s hearty enough for large appetites, and perfect for dinner during those hot days of summer. Love recipes that you can customize? This recipe is perfect for you! The recipe is written for a honey mustard salad dressing, are you big on Ranch salad dressing? Use it! Love Italian Salad dressing? Use it! Want a homemade salad dressing … Use It! Seriously though, this recipe is a perfect way to use up leftover vegetables. Grilled vegetables from last night’s barbecue go perfectly in this salad. Have an odd bit of nuts, heck toss those in too! 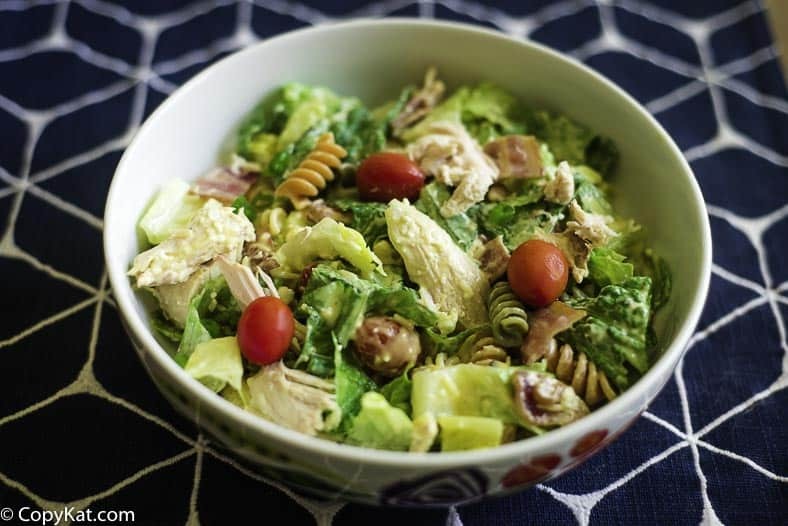 This entree chicken salad is a wonderful way to use leftover cooked chicken. Combine the chicken with pasta, bacon, and fresh vegetables for a delicious meal that won’t weigh you down. 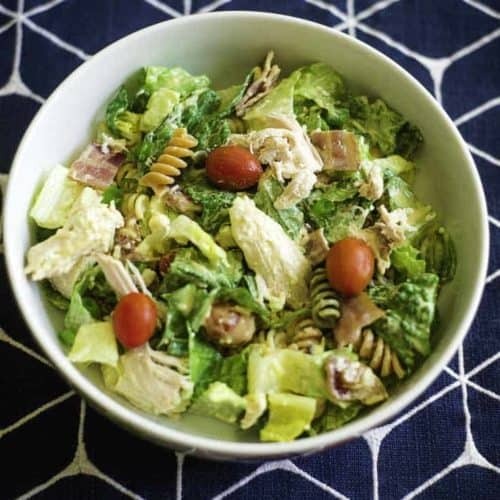 Thanks to Prom Mom for posting this recipe for chopped chicken salad. This chopped chicken salad is a wonderful way to use leftover cooked chicken. Combine the chicken with pasta, bacon, and fresh vegetables for a delicious meal that won’t weigh you down. Chop the romaine or lettuce mix into small pieces. Mix all ingredients, adding enough dressing to coat, about 1/2 to 3/4 of the bottle. Serve with grated parmesan cheese and pepper. Comments from the author. I take a 1 pound package of bacon and cut as much of the fat off as possible and end up with 1/2 pound We like Henri's honey mustard dressing because it is fat-free and milder than some of the others. The dressing used is Henri's Honey Mustard Dressing because it is very low in fat and mild for a mustard dressing. It’s perfect if you don’t like a heavy mustard flavor. However, feel free to use your own favorite honey mustard dressing. Take a 1 pound package of bacon and cut as much of the fat off as possible so that you end up with 1/2 pound. My daughter doesn't like a heavy mustard flavor. You could use your own favorite honey mustard dressing. Our daughter had a friend over for dinner last night who has never had this salad. She immediately asked for the recipe so she could give it to her mother. This recipe is a classic from http://www.copykatchat.com. This was originally posted by Prom Mom. This was a great chopped chicken salad.